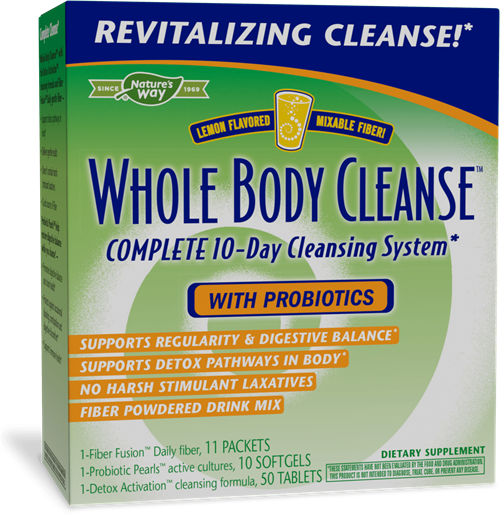 Whole Body Cleanse™ / 10 days with Drinkable Fiber - Nature's Way®. Cleansing up to 4 times a year can help you feel your best. It can be like scheduling a whole new start in your habits and your life. Day 2-8, take 1 packet at night mixed with at least 8 ounces of liquid or your favorite beverage. Day 9-10, take 1 packet in the morning and 1 packet at night with at least 8 ounces of liquid or your favorite beverage. Day 1-8: Take 5 tablets with 8 ounces of liquid in the evening. Day 9-10: Take 3 tablets with 8 ounces of liquid in the evening. Reduce dosage if you experience abdominal discomfort or diarrhea. If discomfort persists, discontinue use. Keep products in this kit out of reach of children. I haven't noticed a change in my bowel movements while using Whole Body Cleanse. Is this normal? Contains milk, soy, and fish gelatin (Tilapia). Fiber Fusion™: Take this product with at least 8 ounces of liquid. Taking this product without adequate fluid may cause it to swell and block your throat or esophagus and may cause choking. Do not take this product if you have difficulty in swallowing. If you experience chest pain, vomiting, or difficulty in swallowing or breathing after taking this product, seek immediate medical attention. If pregnant, nursing, or taking any medications, consult a healthcare professional before use. Detox Activation™: Do not use this product if pregnant, nursing, attempting to become pregnant, or under the age of 12. Do not exceed recommended dose, or take longer than the recommended period, as frequent or prolonged use may result in dependence. Do not use when abdominal pain, nausea, or vomiting are present. Consult a healthcare professional if you notice a sudden change in bowel habits that persist over two weeks. Rectal bleeding or failure to move bowels after use may indicate a serious condition, discontinue use and consult a healthcare professional. Do not use if you are allergic to plants of the Asteraceae (Compositae) family, including ragweed, or if you have bile duct obstruction. This product contains Slippery Elm. Slippery Elm should not be taken together with any medication as it may interfere with their absorption. If you have diabetes, gallstones, or are taking any medications, consult a healthcare professional before use.